Thank you to the vineyards featured in this article for allowing me to attend Roll Out the Barrel at no charge. All opinions are my own. My early morning began in north Austin, where I boarded a private bus and took a seat in the very back. From there, I saw miles and miles of Texas Hill Country. 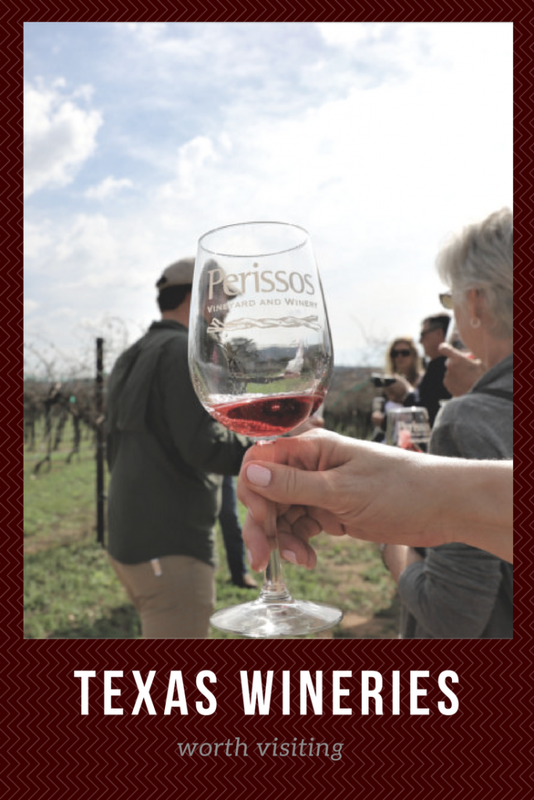 It wasn’t until around 9:30 a.m. that I stepped out at Perissos Vineyard and Winery in Burnet, Texas. That’s when I found myself surrounded by rolling granite hills and fresh country air. When I stepped inside one of the vineyard’s buildings, I heard owner and winemaker Seth Martin speaking. I instantly realized it wasn’t going to be an average wine tasting day. Meanwhile, the tasting had begun. 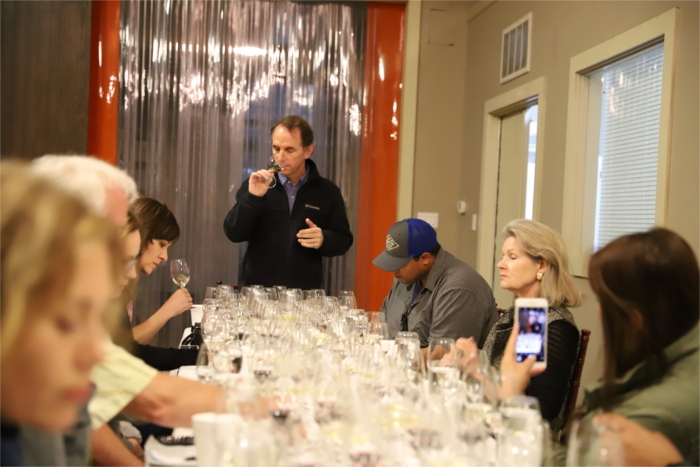 All participants were given two wine glasses–one for the still-maturing wine, and one for the matured. I sampled both a 2016 and 2017 Viognier and enjoyed the light notes as I continued listening to Martin share his passion. After 20 minutes or so, the vineyard owner invited the group to his tasting room in the distance. And it was there, sandwiched between tanks of varying sizes, that I sampled the vineyard’s 2015 and 2017 Tempranillo, Aglianico, and Petite Sirah. I savored the inky notes slowly, swallowing them down instead of spitting them out as advised (I’ve always been a rule breaker like that), until it was time to get back on the bus and on to the next vino destination. My group arrived at Fall Creek Vineyards in Tow, Texas (population 1,249) around 1 p.m. We were still reveling in our magical adventure at Perissos, but eager to take in more of Texas’ sprawling grape fields. And of course, we were ready to experience various shades and flavors of delicious, purple nectar. From there, we were led into the vineyard’s tasting room, where a Last Supper-eque table sat between rows of wood barrels. The table was covered in wine glasses, twinkling before our eyes. I snapped a few photos of the stunning sprawl, then quickly took my seat next to winemaker Phil Price and director of operations Ame Brewster. The entire Fall Creek Vineyards staff offered insight on each wine in a joyful, all-inclusive discussion. Two wines that stood out to me were the Tempranillo and Mourvedre. But none could compare to the captivating Hill Country Sparkling Lenoir, a pink champagne of sorts that’s still in the works. Mid-discussion, Cuadra popped a bottle of the vineyard’s latest project. Bubbly goodness erupted like a pink volcano! The tiny bubbles tickled the insides of my cheeks and tongue, electrifying my taste buds. And again, instead of spitting the liquid out into a cup like I had been instructed to do, I swallowed it down, relishing every drop. “Call me as soon as that pink champagne is ready,” I announced as I made my way out of the tasting room. “Seriously, send me a push notification on my iPhone!” I chuckled. On the bus, I ate a veggie wrap as our driver snaked around Buchanan Lake and headed up Highway 16 to San Saba, Texas. It was my first time visiting the small, rustic town, but I was certain it wouldn’t be my last. 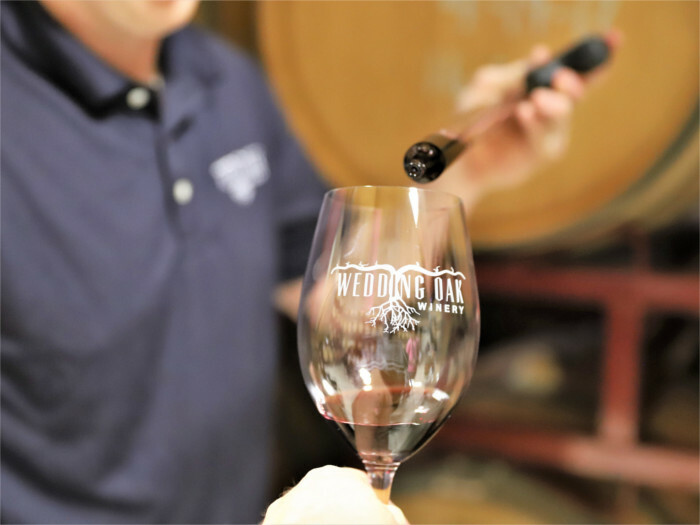 The charming community is being revitalized and Wedding Oak Winery has played quite a part in the revival. 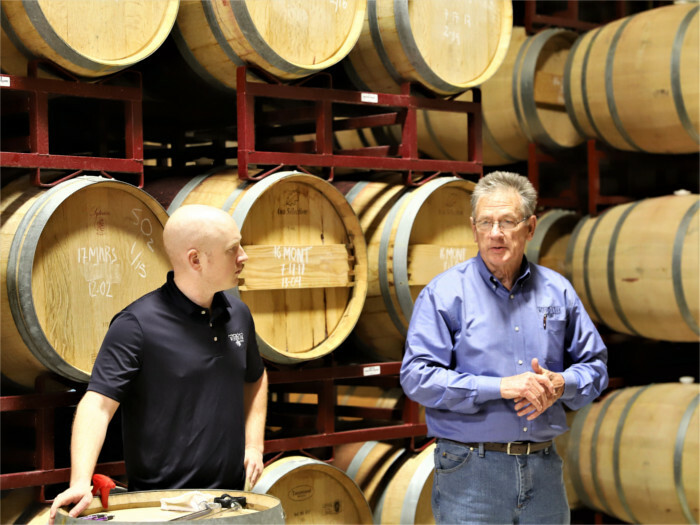 The winery was established by Mike McHenry and a group of friends in a historic 1926 building just under three miles from its namesake: a 400-year-old tree known as Wedding Oak Tree. “Pecans, cattle, wine…What more could you want?” McHenry stated upon our arrival. I, for one, couldn’t think of anything. Our group was whisked into the winery’s tasting room. The staff at Wedding Oak Winery got right down to business, retrieving wine straight out of the barrel with an instrument that can only be described as a giant pipette. 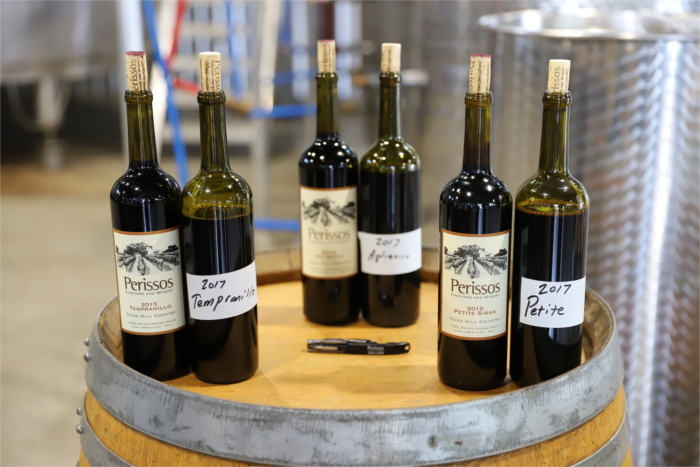 We sampled 2017 Viognier and Petite Verdot, a 2016 Tioja, Montepulciano, and Tempranillo. I noted and cherished my favorites,the Tempranillo and Montepulciano, while listening. 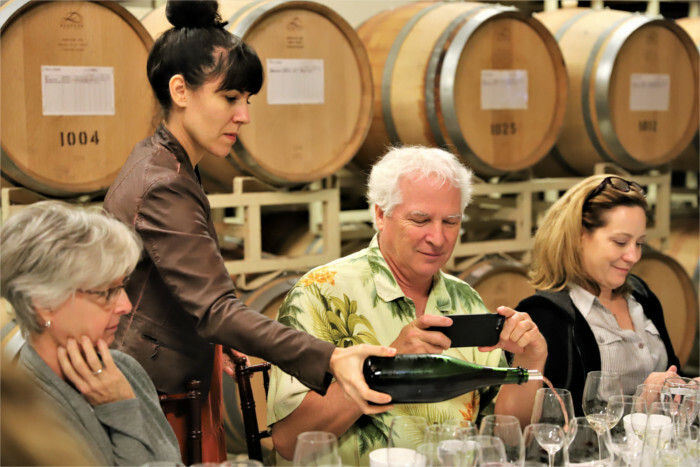 Along with McHenry, winemakers Penny Adams and Seth Urbanek engulfed us in a sea of information. The sun was starting to set as we rolled out of San Saba. With a slight wine buzz (I was warned), I sat back and reflected on the last eight hours of my life. It was challenging to digest all the information I’d received over the course of the day. However, one thing stuck out: each winery stressed the fact that so many varieties of grapes can be grown in Texas, and that Texas is a lot like Europe in the sense there are many different regions and soil compositions. Because of this, each region can grow different grapes, making Texas wine unique. Whether you’re looking for an all-day wine adventure or just a new place to sample reds and whites, these three Texas wineries are definitely worth visiting. 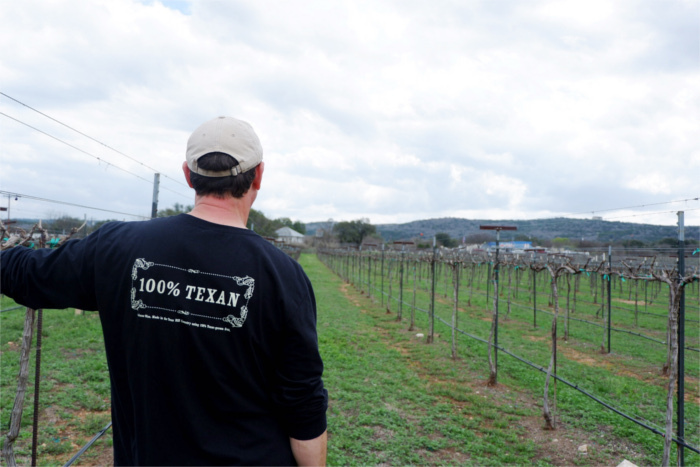 What’s your favorite Texas winery?